Built tough to withstand all the daily wear and tear a hose will experience on a busy farm or construction site, this durable 100' water hose has an octagonal shape for the ultimate in kink resistance. Built tough to withstand all the daily wear and tear a hose will experience on a busy farm or construction site, this durable 75' water hose has an octagonal shape for the ultimate in kink resistance. 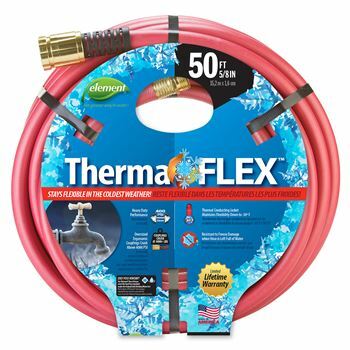 Element ThermaFLEX® hose is the perfect hose for cold weather areas. Flexible even below freezing it is ideal for those brisk spring and fall days as well is in the dead of winter. Our selection of commercial hoses is specifically designed to withstand severe impacts of the work environment and includes three series: Element ContractorFARM, Premium Rubber and Hot Water Rubber Hoses. They are great for any professional and agricultural application. The Element ContractorFARM line includes 50- to 100-foot long 3/4" and 5/8" farm hoses with crush-proof couplings reinforced with kink-preventing armor. Our hot water hoses are proven to be resistant to the damage caused by temperature impact and can handle a temperature range from -40° to 190°F, and Premium rubber hoses can handle a range from -40° to 160°F. The couplings on these hoses are lead free and designed to resist against possible accidental damage caused by the work equipment. Our commercial water hoses will serve for years of use and have a limited lifetime warranty.